Our very own town of Mckinleyville was the focus of a Sacramento Bee story today. Wonder what made them chose Mckinleyville? As always, if asked for a login, humboldtlib is the username and blogspot is the password. I've mentioned here before I'm not too enthusiastic about ethanol, especially when corn is used to make it. My concerns are more along the line of corn being what's known as a heavy feeder, in gardening circles, requiring lots of fertilizer and draining the soil of nutrients. The Sacramento Bee takes a look at ethanol from another angle this morning: What would the growing of all that corn for ethanol do to the state's water supplies? I don't know that I'd really thought of that until now. As always, if asked for a login, use humboldtlib as the username and blogspot for the password. Our very own Steve Lewis takes a shot at anonymous bloggers and commentors in today's Eureka Reporter. I still have to wonder, as I've mentioned before, just how many people visit blogs or are even aware of what they are. Went in to the Suddenlink office yesterday to downgrade my cable TV service. I couldn't afford the [whatever it was called?] basic(?) cable for $55 something a month so went for the $16 a month package. I guess that gives you just a few channels, mostly local ones and FOX. What a shame. I'll miss my History Channel. I probably watch that more than anything else. Then again, most of the time I fall asleep on the couch watching TV anyway. I probably won't miss it all that much. I was kind of surprised with all the complaints Suddenlink keeps getting the customer service rep didn't even ask me why I was downgrading. You'd think she'd at least ask if there was a problem. I guess I'm pretty naive. I've never understood things like this. People have an issue so they go out and get arrested to show how strongly they feel about it. I don't get it. I suppose it might get a little more attention than if they just hold a demonstration and wave signs, but I'm not so sure. I remember some gal posted a message on the West Coast Libertarians Yahoo Group a year or two ago. She was asking for advice on what to do as she'd been arrested trespassing on a military base as part of an anti- war demonstration. I guess the judge really hammered her in court although I forget the exact details. I didn't know what to tell her except to say she should have thought of that before she purposely crossed the line to get arrested. I also suggested that she would have made just as much impact in getting her message across if she'd have stayed on the other side of the line and not gotten arrested. She didn't seem to understand that. I guess that's the counter- culture thing to do: Get arrested for acts of civil disobedience- whether it accomplishes anything or not? The Riverside Press- Enterprise takes a look at the latest black market in California's prisons: tobacco. I have to wonder how soon people on the outs will be dealing with their tobacco habits the same way. We're not quite there yet, but the black market in tobacco is growing outside of prisons. Headed yet again to San Francisco on Sunday. We'd had some rain and I the forecast was for scattered and diminishing showers. I checked doppler radar as I usually do. It showed what seemed to be scattered, but heavy showers, the way I saw it. The also appeared to be limited to Humboldt County. To my surprise, there was hardly enough rain to bother turning on the windshield wipers, until we got to Garberville. I found the rain there rather pleasant, as it was relatively warm out. I told the wifey they should taper off as we headed south. That didn't happen. We kept hitting shower after shower. It became rather annoying because it wasn't heavy rain, for the most part, and I had to keep adjusting the windshield wiper speed as they seemed to being going either too fast or too slow. Stopped at the Moss Cove rest stop between Laytonville and Willits. I noticed a couple madrone trees with some branches that looked like they had some sort of blight on them. We'd parked in the same spot nearly every time we stop there and I'd never noticed that before. I wonder if that was some variant of that Sudden Oak Death, or whatever it's called? Best gas prices, once again: Safeway in Willits. $3.22 a gallon, if you use your Safeway card. Just north of Santa Rosa the rain really started coming down. Visibility was greatly reduced. It was good to see other drivers slowing down due to the conditions. I've seen people up here flying along as fast as they can during heavy rains, even in the safety corridor between Arcata and Eureka. The rain petered out after Santa Rosa and that was the last we saw of it. Get to the Cathedral Hill Hotel. First thing I do, after unloading some stuff and sterilizing the room, is try and check my e-mail. I try and connect to ATT Wifi and seem connected but my browser keeps saying Page Not Found or some such. It's not unusual to have such a problem so I try again, checking my wifi program. It says I'm connected, with a strong signal but I still can't get anything with Firefox. Finally, I notice my wifi program says something about authenticating my IP address or something along that line. I let it do it's thing but it keeps saying it's failed to authenticate whatever. I disconnect and try again numerous times. Nothing. I wonder to myself if maybe ATT WiFi might be down. Nope. It can't be. It says I have a strong signal. I start wondering if the problem is with one of my wifi connection programs and start screwing with them, disabling one or both of them numerous times while screwing around but manage to enable them again. I'd left the laptop with the wifey while she was in the hospital a few weeks ago. My brother- in- law brought it back to Eureka with him when he went down to pick her up. I'd wondered if he tried to use it and messed with some settings? Nope. Everything seems ok.
Maybe ATT WiFi is down? Nope. I have a connection. It's just not letting me do anything. Finally, after pulling my hair out for forty five minutes trying to connect, I decide to finish unloading the truck. As I pass by the front desk I ask one of the clerks if there's been any complaints about the Wifi; "Yes, ATT's been down for over a week. They've had their tech people come in twice but they can't figure out what's wrong...". ATT Wifi's down? Now why didn't I think of that? The helpful clerk also says he'll give me a key to their Business Center for no charge, since ATT's down, and they have a DSL port and a computer for guests to use there. Cool. After unloading my stuff, I go to check out the Business Center down on the Mezzanine. It's a small room with a Dell computer and a FAX/ Copier/ Scanner. There's someone already in there so I decide not to intrude. I realize this could be a problem if everyone in the hotel wants to check their e-mail at the same time. I go back a little while later and nobody's in there. The computer's been turned off. I power it up and am surprised at how fast the computer boots. I'd brought my laptop thinking I could just disconnect the cable from their computer and hook it in to my laptop but thought that might be kind of rude. Despite suggesting to Ed Denson that it might be prudent to carry an ethernet cable with him while traveling, so he could connect to hard line DSL, I'd never followed my own advice. I figured I could go across the street and buy one at Circuit City, but I didn't want to buy another cable. I have three at home. I also wondered if I'd need a password to login to their network. I finally went back down to the front desk and asked and they said anybody could hook up. No need to log in. They even offered me an ethernet cable to use- no charge. What a bunch of folks! So, I managed to pretty much have full internet access for the two days down there. The downside being fighting for space in the Business Room and having to lug all my laptop stuff down there and set everything up whenever I wanted to use my computer. I guess I shouldn't complain about that. At least it's not my old Humboldt County Laptop (Archives March 4, 2006) I had to use the first time I went down there. But, at least I was able to keep some things up and not have to rely on those public mac machines on the UCSF campus. I hope ATT gets the Wifi there fixed before I go down again. Got back into Eureka a couple hours later than usual on Tuesday. We had to go back to UCSF on more time Tuesday morning, adding insult to injury. Could have ended up worse though and at least we got home before dark. As we approached Eureka from the south, we saw the smoke from a fire that turned out to be at a motel on McClellan Avenue. Worrier that I am, that just made me wonder what might be wrong at our house when we get home. I'm the proud father of a bouncing, baby computer virus. Do I deserve congrats for letting it get on my computer on the first place, or finding it? Looks like no harm done. I came home from the Bay Area yesterday and went to check my e-mail. The Zonelabs virus scan starts up, as it does when it's scheduled to. I get rather annoyed with that and nearly always cancel the scan. After all, everything that goes into the computer gets scanned. How could I have a virus? I decided to let it run this time, since it is a good idea to scan for viruses on occasion. Did a full scan on the laptop last week for the same reason, with negative results. After all, you could download a virus that hasn't yet been added to your anti- virus program's virus definitions. So I let the scan continue since I couldn't remember the last time I did a full scan. Went out to clean out my truck, coming in occasionally to check on the scan progress and after about twenty minutes saw something I'd never seen before: The Zonelabs virus scan window showed an infection found. That got my attention. It was in my Documents and Settings file. I went in to the file but couldn't find the virus. I was a little nervous about deleting something in Documents and Settings so tried to find out what this supposed virus does. I click on Zonelab's More Information tab and I'm sent to this page. So I go to the Symantic (Norton Anti- Virus) web site and see if they have any info on it. A search there comes up with nothing. I then try doing a Yahoo search for not-a-virus and get this page with no real specific information I could find in any of the links. One page said something about the "virus"(assuming I'm reading it right) being some kind of remote control application. Rather strange there isn't more info on this supposed virus. I was nervous about deleting it so went ahead and Quarantined it. Supposedly it can't do anything if it's quarantined and, if I find not having the file screwed something up, I can always restore the virus and then repair it. But everything's working fine and seems to have been working fine for some time. I'm wondering how it got on this computer? I suspect it was one of those web sites I mentioned here a while back where I clicked on some link and the download window popped up. After I supposedly downloaded something in two seconds, I couldn't find anything that had been downloaded. Pretty clever of whoever did it. I'll have to run virus scans more often. Anybody out there know anything about this virus or have a good source for finding out something about it? Yet another call to silence opinion- This time by our very own Robash. Why not let people open their mouth and make fools of themselves sometimes? Not referring to your comments here, Rob. I think we all know the types of comments I'm referring to. In regards to the issue Malkin commented on; I wouldn't be too quick to criticize. There have been some attempted school shootings in which the shooter was stopped by armed students or staff. CLS describes some of them on his Classically Liberal blog. I make this post with reservation as I don't want to start an argument about gun control here. Just suggesting you address the issue at hand rather than simply criticize the other person or call for her silence. Looks like Allan Hemphill, Chairman of the North Coast Railroad Authority, isn't happy with Dan Walters' recent slam of the NCRA. No surprise there. He's one of many people determined to re- establish the rail lines, at least from Willits southward, no matter what. It will be interesting to see if Dan Walters makes any sort of rebuttal. I hope so, but I'm not sure that Walters does that sort of thing. In any case, I'm still wondering whose pockets all the millions of dollars that have been thrown at he NCRA have ended up in? or so it sounds. I actually saw an ad for these folks the last time I was in San Francisco. I thought to myself then that I wouldn't mind having some advertisements on my truck as I was driving around town. Of course, the average of $33.00 a month isn't much, but in my situation every dollar helps. Naturally, it wouldn't work out for me. First of all, it doesn't look like they have any ad campaigns going up here, at least from a quick glance at their locations map. Second, they require among other things, that you drive a minimum of 1000 miles a month. That leaves me out. I'm wondering how long this outfit will last. Looking at the magnetic sign pictured in the SacBee story, the lettering seems awfully small. I can't imagine anyone being able to read the sign unless they were right close up to it. Not a good idea for advertising. Still, I'll keep an eye on them and see if they open something up here. In the meantime, some of you from down south could always see if they have something available in your area. The wife has been staying at her parents house lately. This house is too cold, dark, damp and dirty to be conducive to good health. That finally gave me the chance to try something I've been wanting to check out. Some time ago I got a sample package of Tide Coldwater laundry detergent in the mail. The wife usually does the laundry so I suggested she try the cold water stuff. She was skeptical, didn't really want to try it and never did. So, since I had to do a load of my own laundry yesterday, this was my chance. Looks good so far. Of course, I'm probably the worst one to judge how clean clothes are so I should probably have the wifey give the clothes a sight and smell test. Still, they seem clean enough to me and I washed the load in cold water only. Probably could have saved even more money by drying them on the clothesline rather than the gas dryer. Pending rain was a convenient excuse to use the dryer. I'll have to admit to still being a bit skeptical about using this stuff, myself. First, we generally don't buy name brands of anything. We get whatever seems like the best deal at Grocery Outlet or Winco. 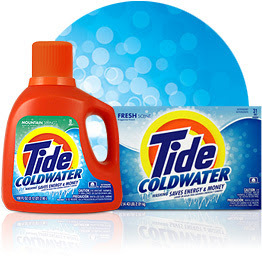 If I had to buy Tide Coldwater at the regular price at a normal store, I don't know I'd go for that. Second, I'm naturally skeptical of their claims and really wonder if this is much better than using any other detergent with cold water. I know the wife has washed some things in cold water but those were sensitive materials and such. Maybe I should try some el cheapo detergent with cold water and the end result would be the same? I don't know, but this is one area of saving energy (thus money) I haven't tried yet. I'll be looking into this further. Now, if I can only figure some way to take the hassle out of hanging clothes on the clothesline to dry, I'll really be in business. Looks like the newly elected District Attorney in Mendocino County, Meredith Lintott, has started cleaning house. She's fired her second in command, at his request. I can't help but wonder if that office will end up with a turnover like the Humboldt D.A.s? Yet another Tax Day protest at some of our local post offices. Rather embarrasing for a libertarian as the Tax Day protests have traditionally been a libertarian endeavor. Still, as I've said before, good to see some on the Left realizing it might be better if they kept more money in their pockets to spend on what they want their money spent on. But, that wasn't really the cause behind yesterday's events, at least from what we read in the papers. Seems the leaders of the event aren't concerned so much with taxes, they just want the money government takes from them used for different purposes. Oh well. I suppose that's progress in some sort of way. Perhaps some common ground being reached. Interesting that their penny poll in Arcata last year showed people's top three spending priorities to be Education, Environment and Housing- none of which are within the purview of the federal government according to the United States Constitution. National Defense (not Offense) is a constitutional function of the federal government. Arcatans wanted only 2.9% of their tax dollars to go to the Military. Seems to be a disconnect there, but I don't think it fair to expect most people to consider the Constitution when taking a penny poll. I've suggested here before that Liberty is something most people value and, as such, it should be common ground for bringing people together. Zombie takes a look at another way people have come together: Hate, as he describes it, is bringing some elements of the Left and Right together. Not sure that hate is the word I'd use, but I'll let Zombie speak for himself. Well, it's out now, as most everyone knows. No more mystery as to who Captain Buhne is. I liked it better the way it was. What becomes of the Buhne Tribune after the outing remains to be seen. Looks like one of my blogging colleagues wants to take things even further and drag all the rest of the blogs down with Buhne, starting WITH ME! A year or so ago I made mention here of a commentary by the Sacramento Bee's Dan Walters where he slammed the North Coast Railroad Authority (NCRA), labeling it a boondoggle. Long time readers of this blog would know I agree with him. Looks like Dan's back at it again with another slam on the NCRA. As always, if asked for a login at the Bee's web site, use humboldtlib for a username and blogspot for the password. Looks like some on the Eureka City Council are considering forming yet another committee- a Transportation Management Committee. This one will deal with traffic problems in Eureka. I have to wonder if Eureka has traffic problems unique to itself or do we have the same problems every other town does? No mention of any specific cures for any problems but I'm sure planting trees along the streets will be one suggestion, as always. They claim trees alongside streets slow drivers down. They probably do, since they limit driver's visibility. Not sure I like the trade off. I certainly don't like people racing down the street as fast as they think they can get away with. The thing that sticks in my mind probably more than anything else, though, are pedestrian vs. vehicle conflicts. I know I'm not the only one and, just by chance, a letter to the editor today in the Eureka Reporter takes the words right out of my mouth. Well said, Trish Palmer. You beat me to the punch. First, you have the problem of pedestrians who only look once, if they look at all, before crossing the street. I see that all over town. Henderson Center's usually a good place to see that happen. Not a good way to walk. Then, as Trish mentions, you have the drivers that want to be nice and stop for someone standing at a crosswalk. No one else stops, thus creating a dangerous situation. I saw that happen the other day on H Street in Eureka. Driver in the right lane stops for three adult males waiting at the crosswalk. Nobody in the two lanes to the left stops. If the three guys would have been like so many other people crossing streets in Eureka, they wouldn't have looked and might have gotten hit by the cars that didn't stop. As it was, they were attentive and waited for the cars to pass before crossing the street, something they could well have done without the nice driver stopping to let them cross. Ms. Palmer also mentions the accident that occured when a similar nice driver stopped for a pedestrian causing a rear end collision. I believe there were more than two vehicles involved in that one. A nice driver stops for a pedestrian. Another driver, not noticing or expecting the nice driver to stop, ends up slamming into nice driver from behind. Well, at least she was being nice. Nice drivers can pat themselves on the back for being nice but, as far as I'm concerned, they should let the pedestrians find their own way across the street, not create a potentially dangerous situation for everyone involved by stopping at the crosswalk. When I cross the street, I don't want cars to stop for me. I wait for an opening and then go. It's safer for everyone that way. I don't know how a Transportation Management Committee could address the problem of pedestrain vs. vehicle conflicts. Being an oyster lover, it's good to see Coast Seafoods will be continuing and perhaps expanding operations on Humboldt Bay. Sorry to see it took them so long to get the needed permits. In the hard copy version of the story they have some sidebar info on how the oysters are raised and such. Fun stuff. One question I have, and I hesitate to bring this up, is whatever came of the dioxins they found in some Humboldt Bay oysters a while back? I read some blurb in the news a few years ago regarding dioxin contaminated oysters and that was the last I've heard of it. I guess that's something we probably don't want to know? Along similar lines, I wonder about other sealife in The Bay: Are the fish and crabs polluted with dioxins? I've wondered about that since I moved up here since I used to fish in the bay regularly. Back then I wasn't concerned about dioxins. If fact, I don't know that I'd even heard of dioxin back then. Still, there's all kinds of stuff that runs into the bay and I wondered if it ended up in the sharks or rockfish I'd often catch and eat. Now we're told there's all kinds of pollution seeping into the bay. I'm not sure how much of that is hype and how much is really something to be concerned about. I asked a marine biologist I'd met about the issue back in the early eighties. He was in charge of some ecological studies being done at Humboldt Bay Power Plant. He said you could tell if the fish had pollutants in them pretty much by looking at them, if memory serves me correct. I assumed he knew what he was talking about, but now I'm finding that a little hard to swallow- no pun intended. I suppose, if the fish are polluted, it must not be too bad. I've eaten a lot of fish, crab and oysters out of Humboldt Bay over thirty- plus years, and I'm still kicking...at least so far. I finally got chickadees back into at least one of my bird houses. How cool. It seems to be true what they say about cleaning old nests out of bird houses. 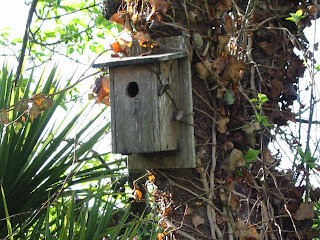 If you don't, next year's birds think the bird house is already occupied and look elsewhere. As I mentioned here before, the first year I put the chickadee houses up, a pair moved into the one on the chestnut tree on the south side of the house. I cleaned the box out after they left and we had new birds move in for a few years. Then, for some reason, I stopped cleaning out the boxes. No more chickadees. I finally decided to clean out both houses earlier this year. We'd seen chickadees in the back yard and were hoping some would occupy the boxes but didn't see any indication of interest...until yesterday morning. I saw a small bird fly into the box on the apple tree. Then I saw it dart out a few seconds later. Shortly after that he was in and out again. He was so quick I couldn't get a good look and couldn't even tell if he was building a nest or feeding the female. I wasn't sure it was even a chickadee as it looked too small and I couldn't see the colors. This morning I finally got a good look. It was a chickadee. This is the first time I believe I've seen any birds move into in the apple tree box. I've seen them checking it out before, but never moved in. They usually prefer the chestnut tree box. This is fun because chickadees are friendly birds. I normally try to go out of my way not to comment here about the latest media brouhaha going on at any given time, but I thought this was worth a mention. Despite all that's been said about him being a conservative, redneck, racist or whatever, looks like some in the Democratic Party are concerned over radio host Don Imus getting the axe. Seems they feel he was one of the few popular talk show hosts that gave them good air time. Some back and forth on the pet neutering proposal before the Board of Supervisors is starting to show up in the letters to the editor. Eureka resident, James Wasetis, not only seems to support the ordinance, he wants to take it one step further and require licenses for cats. On the other side of the aisle, Allison Reed, doesn't seem to think much of the idea. She describes herself as pretty much leaning to the left. Seems like this is an issue that can't be identified as either left or right wing. In related news, from Southern California, another case of animal rescuers being prosecuted for animal cruelty. The time of year we all look forward to: The deadline looms for filing your state and federal income taxes. It's a couple days later this year, falling on April 17 rather than the 15th, the reason for which escapes me right now. My check will be in the mail today. Along that same line, the Sacramento Bee's, Dan Walters, sheds some light on the common misconception that the more affluent people in the state are undertaxed. As I mentioned before, I'm humbled by Leonidas adding me to his Thinking Blogger list. One of the reasons I've been slow to fulfill my duties as an award winner is I'm having a hard time coming up with five blogs that show more dynamic thinking than usual or actually make me think. After some deliberation, i think I finally came up with four, although I'm not sure all really meet the criteria, at least technically. After all, don't most of the blogs we visit usually tell us things we already know? Lefties go to the Daily Kos and righties go to Little Green Footballs(?). I'm just guessing on that as I don't have either of those blogs on my daily list. #1. Fighting In The Shade. Yep, our very own Leonidas' blog. Sure, it's a payback, but deserved. His is actually one that generates thought with me as he often deals with subjects I don't and might often have a different take on an issue than I might- The Iraq Invasion and WOT, for example. This guy (and, yes, it does seem to be a guy) does a great job of articulating libertarian thought. When I first visited his blog I was wishing I was the one that wrote some of the stuff he puts out. Not all subjects are ones that I find of interest. For instance, the one today about the violinist in the subway...where'd that come from? Lots of typos like missing letters, wrong verb tenses and such. Lengthy and redundant. He tends to go on and on, often writing more than enough to make his point and then starting the same argument over again. Doing so, he often only has one or two posts on his main page simply because of the length of his posts. Nonetheless, I think he usually puts out some great stuff. Oh sure, he beats some things to death, like this Reggae On The River and Mateel stuff. Still, he's one lefty that I think at least tries to see both sides. The main thing that gets me thinking, reading his blog, is how anyone can seem to have some common sense and be fairly reasonable, yet come up with some of the conclusions he comes to. Phil Angelides for Governor??? That was out there. I've liked Radley Balko's writings since before I knew he had a blog. He doesn't allow comments on his blog, although he has responded to my occasional e- mails. I've always said a blog that doesn't allow comments is only half a blog and I'll stand by that. I've run into a number of issues and various links from his blog I might not have found elsewhere. He does tend to beat the police "brutality"/ SWAT mentality thing to death. Hey, I might agree with him but don't want to read about it day after day after day. Like I said, he does more than just blog. He's also a columnist for FOX News and works with the CATO Institute. Sharp guy. I ran out of blogs for my top 5 Thinking blogs. Sure, I probably have a couple dozen on my daily blog list, but most aren't what I consider Thinking blogs. Most are more light commentary and discussion (kinda like mine). I list Blue Flypaper as a memorial. It was my favorite leftie blog until she quit posting over half a year ago. Her hard- hitting commentary was a must- read for all sides of the political spectrum. I'll miss her commentaries. Please come back to us, Blue. Looks like the Board of Supervisors held off taking any action on the proposed pet neutering ordinance. Makes sense, since two of the five Supes were absent. A similar proposal on the state level got stalled in committee but should be back in some form before the end of the month. Regardless of one's feeling on these sort of proposals, do we really want to have both the county and state pass such a law? Looks like Humboldt is following the lead of some other counties and considering an ordinance that requires dogs and cats over four months old to be neutered. A bill is also being considered at the state level along the same lines. I find some of the expemptions to the county proposal rather curious: Dogs used by law enforcement and guide dogs? Seems to me they're just as capable of having puppies as any other dogs. I guess the thinking is that such dogs are assumed to have responsible owners. Still, seems a somewhat arrogant assumption to make. I'm actually very sympathetic to the idea. Too many people have pets that shouldn't and there are some irresponsible pet owners even among those who take relatively good care of their pets. Still, something bugs me about this proposal. I just can't put my finger on it. Maybe because it's just another case of government telling us what we have to do. Anyone have any good arguments against requiring neutering of pets? Looks like all may not be lost in regards the Willits freeway bypass proposal that ended up being tossed aside when the rest of the state was given the construction money. Some are thinking it may be possible to fund a scaled down version- a two lane bypass rather than the planned four lane. This is good news, if it works out. I'll probably always stop in Willits, if only to buy gas, but it will be nice to have the through traffic out of the way when I do so. Then again, even if approved, construction wouldn't start until 2012, or later. Who knows? I might not be around to see the project even started. Not too surprising, is it? It should make some of you happy- at least those of you pissed off about pot growers not paying taxes. The Board of Equalization has decided to apply sales tax to marijuana sold at the many medical marijuana clinics across the state. Since pot isn't dispensed by a pharmacist or approved by the FDA, I guess it isn't considered medicine, according to them. Kinda throws a kink into what a friend (now retired from the Casa Grande, AZ Police Dept.) suggested to me years ago. He said, "The only reason drugs aren't legal is they haven't figured out a way to tax them...". Hmm...does this medical mj tax make that any more, or less, true? Humguide has a new poll up asking what your favorite Humbolt County events are. You have to register with Humguide and log in to participate in the poll. I never go to any events so I didn't choose any of them but, since I love oysters, I'd probably have chosen the Oyster Festival if I'd made a choice. Missing from every story was a breakdown of support or opposition among terminally ill people. I'd like the Harris poll to go to every hospice across the state, and ask as many lucid, dying people what they think. Consider what difference it might make if, in contrast to the 70 percent of all residents in support, it turned out that 70 percent of terminally ill patients were against? Would some opposition soften if it turned out that 80 percent of terminally ill patients wanted the ability to choose the day to die? I wonder. She does bring up a good point: There seems to have been little consideration of those most directly affected by the ramifications of this bill- the terminally ill patients themselves. But I see that comment from a slightly different angle and I'll take it a step further. Sure, no one is asking the terminally ill their opinion, but what if they had and it ended up either way, with either 70% of them for or against the right to die. What if you were one of the 30% who felt the opposite of the majority? Shouldn't this be a personal decision not subject to a majority vote? I realize Patty Berg's bill is mostly about the right to personally decide, but to throw opinion statistics into the fray, while interesting, also suggests that it's totally appropriate for 70% of a given group to dictate to the 30% how they'll live their lives. So, even if some hypothetical group of hospice associations took a poll, and the state legislature decided to cast their votes for or against AB 374 based on that poll, how would you like it if something that literally affected your life in a bad way was passed because 70% of the group felt differently than you? I realize that was not the intent of Ms. Burstiner's commentary. That's just the way I read the last paragraph. Thing is, I think all too many people nowadays have no problem with- what should be personal decisions- being made by someone else. Alas, it is true. That is the way we've come to accept living nowadays. Isn't it? I've come to hate that old childhood saying, Majority rules! Seems too many others around the country have embraced it. Or I should say she lives. Quite a while ago I brought up the old Humboldt Honey poster that caused such a ruckus in the county decades ago. Well, The Arcata Eye did a story on Humboldt Honey giving a history of the poster and even a link that shows some of the letters to the editor on the issue back then. Back when we discussed it here, I mentioned someone had told me, back when I worked in Juvenile Hall, the mother of one of the kids there was the original Humboldt Honey. From what I remembered of the poster, she could well have been. But nope, it wasn't her. I guess the real model for the picture hails from Scotland and after looking at the poster for the first time in so long, it definitely wasn't that kid's mother. And Heraldo(?) was right. I guess Picky, Picky, Picky, on E street in Eureka does still have a copy of the poster. In fact, they have reproductions for sale. I might have to go buy one. The one problem with the Eye's online article is it's hard to read the small print on the poster. A while back I was trying to find free wireless hot spots in San Francisco hoping to find a few in places I frequent while there. While searching, I found this news item claiming San Francisco is one of the top wireless hot spots in the country. Well, maybe so, but it didn't seem to work that way for me when I was in The City the last three days. I actually lugged the laptop around with me all day Monday trying to see if I could find an open network. Two places were of particular interest: UCSF Medical Center on Parnassus Avenue and the UCSF Annex at China Basin. I tried it before with no luck on Parnassus but decided to give it one more shot. There were probably nine networks that I could pick up with three or four that showed as non- secured. I tried to get into all of those. Seems to me I actually connected to one or two out of those but they wouldn't let me do anything. The wireless program said I was connected but my browser kept saying "Server not found" or some such. Gave up on that and tried China Basin after taking the UCSF shuttle there. Same thing. Maybe ten or so networks there with four or five unsecured. Some I connected to, but that was all I could do. Finally got a strong connection to one, opened my browser and, lo and behold, a web page came up. It was the log in page for University of Arizona. That's as far as I could get without a password. Nope. No free surfing in Frisco at those places. Why so difficult? Maybe I'm doing something wrong? The Orange County Register takes what seems to me is a pretty level- headed look at Prop. 36, the ballot initiative passed a few years ago requiring treatment instead of incarceration for drug offendors. Looks like Meredith Lintott won the race for Mendocino County District Attorney with 46% of the vote. Since she didn't get over 50% of the vote some are saying it's open to a legal challenge but, during the debate I listened to, I believe all three candidates said they'd accept whatever the results were. Looks like Schlosser might have been the spoiler in this one since most seem to think votes for him would have gone to Faulder had Schlosser not run. As some of you may know from an earlier post on Eric's blog, San Francisco, in its infinited wisdom, decided to ban the ubiquitous plastic grocery bag. There's an op- ed in USA Today this morning that gives a few reasons one might not want to consider doing the same thing elsewhere. Select Smart has their presidential candidate selector set up for the 2008 presidential race now. Some of you might remember taking their quiz as I've linked to them before here. No third party candidates are included. Here's my results after taking the selector quiz. Pleased with Ron Paul, of course, but surprised at some of the other top candidates. Also glad to see Clinton and Edwards at the bottom of the list. Take the quiz yourself and see which candidates most match your qualifications. You might be as surprised as I was with some of the candidates. (40%) 18: Gov. Tom Vilsack (D) Withdrew from race. (0%) 23: Sen. George Allen (R) Withdrew from race. (0%) 24: Sen. John Kerry (D) Withdrew from race. (0%) 25: Sen. Russ Feingold (D) Withdrew from race. The Sacaramento Bee's, Dan Weintraub, takes a look at one of the issues involved in the looming California State University strike. He thinks staff benefits should be included when discussing salary issues. The CSU Professors don't. As always, if asked for a login, you can use humboldtlib as the username, blogspot for the password. Oh, it's ending today? I hadn't even noticed we had one, aside from the mention in the newspapers. Guess that shows how socially retarded I am. I never do anything.